A statue of a sea dog who became an unlikely war hero has been escorted from Scotland by the Norwegian Navy. 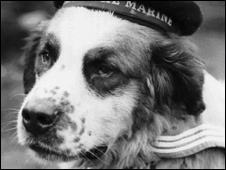 Bamse was a mascot on the Norwegian Navy minesweeper the Thorrod, which was stationed in Montrose and Dundee during World War II. It is claimed the St Bernard saved the lives of two sailors during the war. The Norwegians are shipping a copy of the statue, which was erected in Montrose in 2006, from Leith Docks to Honningsvag, his original home. The Navy ship KV Leikvin berthed alongside the Royal Yacht Britannia on Saturday morning to take aboard the bronze, which weighs a quarter of a ton. David Windmill, the honorary consul general of Norway in Edinburgh, joined representatives from the Norwegian Navy, the Royal Navy and the statue's sculptor to watch the handover. The statue will be unveiled in Honningsvag on 19 June. Bamse died in 1944 and is buried in Montrose with his head facing towards Norway, where he started life as a family pet. His exploits included going into the water to rescue a sailor who had fallen overboard and knocking over a knifeman who was trying to attack a young lieutenant. Dr Andrew Orr, from the Montrose Heritage Trust, who co-wrote a book about Bamse, said: "It is very exciting to see this copy of our Montrose statue heading for Norway. "It will reinforce the bonds between the Scots and the Norwegians, and will serve as a memorial to Norwegian sailors in the dark days of World War II. "We are looking forward to the unveiling at Honningsvag."